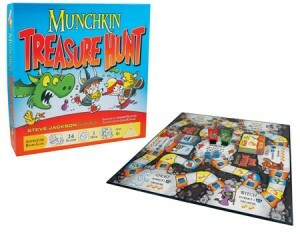 Steve Jackson Games has announced their new board game, Munchkin Treasure Hunt. It's a new stand-alone board game designed to introduce younger gamers to the world of Munchkin. Munchkin Treasure Hunt is a fun boardgame for up to six players, ages 6 and up – now everyone in the family can be a Munchkin! (Don't worry... you don't need to know how to play any other Munchkin game to enjoy Treasure Hunt.) Treasure Hunt comes with a board, two custom six-sided dice, 96 colorful cards, four blank cards (so you can write your own! ), six character standees, and a rulesheet.